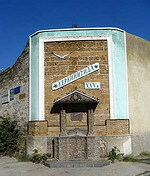 Evpatoria or Yevpatoriya is a city located on the Crimean Peninsula north-west of Simferopol . With a population of 108,000 inhabitants, it is one of the major Ukrainian Black Sea ports, a rail hub, and a resort town. Khazars, Cumans, Mongols, the Crimean Khanate, and the Ottoman Empire. During this period the city was known as Gusliev (beautiful settlement). Yevpatoriya became a Slavic city in 1783 when the Russian Empire finally conquered Crimea. Most popular for its sandy beaches and shallow water, which is ideal for sunbathers and swimmers, the city is alive with tourists from May until October. Most visitors come for the sun and the sand, some come to cleanse and rehabilitate ailing bodies in one of many sanatory (health resorts), while a few come to see the rich history that goes back more than 25 centuries.